BARNABY Joyce's renewed leadership ambitions have understandably baffled some Australians, given it hasn't even been a year since scandal forced him to resign. 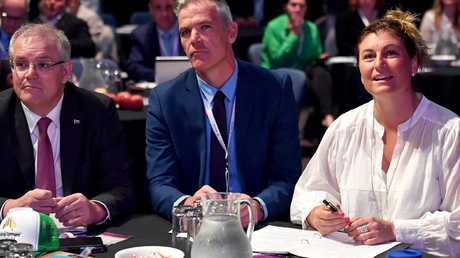 Mr Joyce relinquished the leadership of the National Party in February amid the controversy generated by his affair with former staffer Vikki Campion. That story grabbed all the headlines, but the last straw that forced him out was actually a sexual harassment allegation from West Australian farmer and businesswoman Catherine Marriott, who claimed Mr Joyce had harassed her after a function in August of 2016. 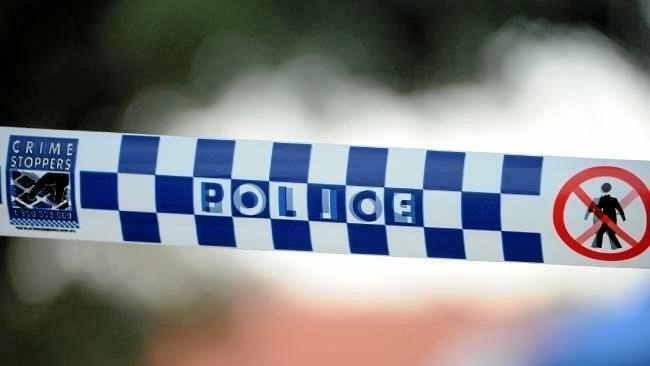 He emphatically denied the accusation, and an eight-month investigation by the NSW branch of the Nationals found "insufficient evidence" to support Ms Marriott's claim. Which brings us to an awkward coincidence that caught our eye this morning. 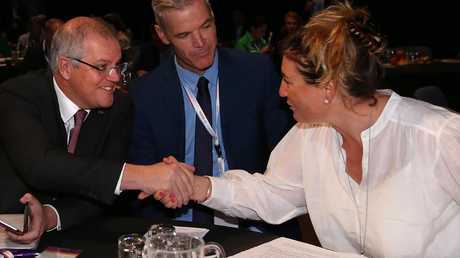 While speculation about Mr Joyce's intentions swirled in Parliament House, Ms Marriott was in Canberra, being photographed with Prime Minister Scott Morrison. The images were a remarkably timed reminder of the reasons for Mr Joyce's political downfall. Speaking to the ABC's 7.30 program last month, Ms Marriott declined to describe the alleged incident with Mr Joyce in detail, but admitted it had a profound effect on her. "I walked up to my hotel room and burst into tears. I then couldn't sleep that whole night. I actually didn't sleep for a week," Ms Marriott said. "When it happened, he was the agriculture minister. He was a very popular agriculture minister at that time, and I didn't ... I was ... I'm just a little human against a big system, and I was terrified." She lodged a confidential complaint with the National Party in February, and never intended to make it public. In fact, she was terrified when the complaint was leaked to the media. "That is one of the most frightening things that you will ever have to live through," she told 7.30. "The control that I had over my own identity was taken away, and that's something that I will live with for the rest of my life, and I think it was really unfair, it was really horrific." 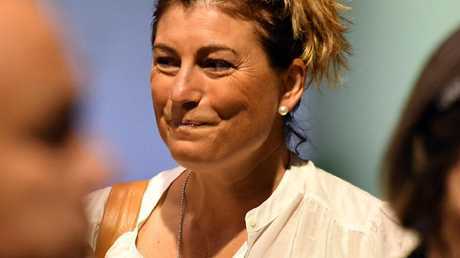 The morning after her interview, Mr Joyce called her claim "defamatory" but said he would not be taking any legal action. "I'm not going to start going through it, but I can - I have absolute clear recollection of everything from that day. I know the person very well. It is defamatory and I will leave it at that," he said. "It is not the truth and that's probably the thing that annoyed me the most. I watched it last night and I'm not better informed now than I was at the start." Meanwhile, Ms Marriott thanked the people who had supported her on Twitter, saying their "energy and conviction" had kept her going. In recent days, she has retweeted several comments suggesting female voters will abandon the Nationals if Mr Joyce reclaims the leadership. That view was eloquently expressed by Alana Johnson, a founding member of the group Australian Women in Agriculture, this week. 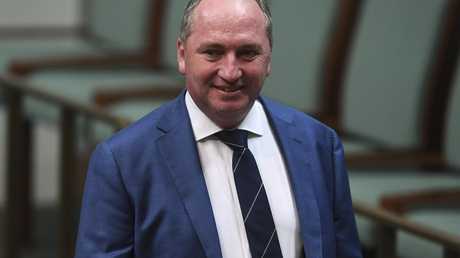 "I think rural women are angry at Barnaby Joyce and his behaviour and they would be very disappointed if the National Party thought he is the calibre of leader they want," Ms Johnson said. "There is now an understanding amongst more and more people that how you practise politics, how you partner, how you parent, how you do business, are all a mirror as to who you are as a person. "This is about party identity. If those individuals in the party want to have the support and the place in rural and regional Australia that it should have, they have to vote to create the party we are looking for." 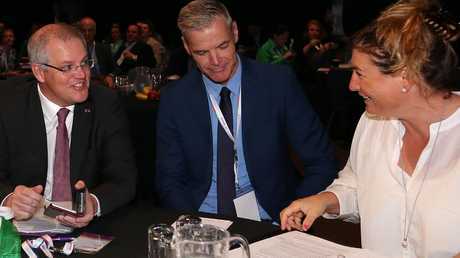 Ms Marriott was photographed with Mr Morrison as both of them attended the National Farmers' Federation 2018 National Congress this morning. The Prime Minister used his speech there to defend current Nationals leader Michael McCormack and backflip on the idea of establishing a new visa category for overseas farm workers. The visa proposal has created tension within the Coalition, with some believing Mr McCormack has not pushed hard enough for the visa proposal. "We will work to establish an agriculture visa. That is the long-term solution," Mr Morrison told the audience this morning. "It has been Michael McCormack and I who have been working on this plan from the day we signed up as a coalition." He said Mr McCormack had championed the idea in a constructive and practical way. Yesterday Mr Joyce fuelled rumours Mr McCormack could face a challenge as early as next week, saying he wasn't campaigning for the leadership but was ready to accept it if asked to by his colleagues. "I have not made one call to a one colleague asking for a vote," Mr Joyce told Sky News. In other words, he wanted everyone to know his hands were clean. But Mr Joyce confirmed he did indeed want to be leader again. Mr McCormack tried to hose down the speculation during an interview with Sky News today. Host Laura Jayes interjected, saying suggestions National MPs were not thinking about the leadership were "just not true".